One of the four Lekki bank robbery suspects has taken the Nigerian Police Force to court, asking for N1million damages for alleged unlawful detention. In a suit at the Ikeja High Court in Lagos, Ebi Tosan prayed that the police be directed to release him on bail. Respondents in the suit are Lagos State Commissioner of Police and the Officer-in-Charge of the Special Anti-Robbery Squad (SARS) in Ikeja. 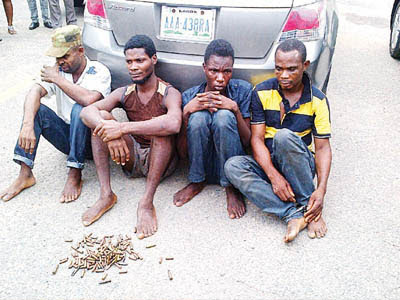 Tosan, 20, was paraded by the police with Duke Odogbo, 38, Lawrence Kingsley, 31, and Ekelemo Kuete, 30 in connection with the March 12 robbery of First City Monument Bank (FCMB) in Lekki, Lagos. The applicant, who was arrested on April 5, claimed that it was unlawful for the police to keep him in detention without bail. He claimed that it was unlawful for the police to keep him in detention without bail. The matter could not be heard yesterday when it came before Justice Lateefa Okunnu because the police did not bring the applicant to court. He prayed the court to declare that Tosan’s arrest, torture and continued detention violated the applicant’s rights under Sections 34(1)(a), 35(1)(4) and 41 of the 1999 constitution. Amos averred that he had not been allowed to see his nephew since his arrest on April 5. Last July 9, Justice Okunnu directed the police to produce the applicant in court yesterday. But, he was not brought, thereby stalling the hearing of his application . Justice Okunnu has ordered that Lagos State Attorney-General be joined in the suit. She adjourned the matter till October 22. The judge said if there was any urgency, the applicant could appear before October 22 before another judge who will be sitting during the court’s yearly vacation, which begins next week.